Where can you find cowboys, cowgirls, spectators and spectacular mountain views together in one place? The Rooftop Rodeo in Estes Park, of course. For 89 years, the event has brought “boot-stompin’ and horse-kickin’, and bull-buckin’ cowboy fun” to Estes Park. A parade, rodeo events, kids activities and special nights are just a few of the annual highlights at one of the most scenic rodeos in the country, July 6-8, 10-12, at the Fairgrounds at Stanley Park. Rodeo week kicks off, July 6, with the Rooftop Rodeo Parade at 10:30 a.m. on Elkhorn Street downtown. This year’s marshal, climber Tommy Caldwell, will lead the parade. Tommy, along with his wife Becca, son Fitz, and parents Michael and Terry have been long-time residents of Estes Park. Recently, Caldwell and his climbing partner, Kevin Jorgeson tackled the 3,000 foot Dawn Wall on El Capitan in Yosemite National Park. The theme of “Wilderness, Wildlife, Wonder” promises to deliver some outstanding parade entries. Awards will be presented to the winning float in each category, including Float, Marching, Commercial, Mounted and Hitch, and the best overall entry wins the “prestigious” Brownfield Award. Rodeo events are steeped in tradition and reflect the required skills it takes to work on a ranch or open range and are very much a part of the heritage of the west. Each night at the Rooftop Rodeo, guests will witness some of America’s best cowboys and cowgirls competing in six Professional Rodeo Cowboy Association events and Women’s Professional Barrel Racing. In addition to the main events, the Rooftop Rodeo has fun for the whole family. Mutton Bustin’ is one of the more popular events and offers the younger cowboys and cowgirls, between ages 5-8, a chance to ride “wooley bulley.” For kids ages 8-12 the Cash Catch is as much fun to watch as it is for the kids to do. Contestants chase after a sheep with a $5 bill attached to it’s back. On July 8, bring everyone for “Dress as a Rodeo Clown Night.” Kids ages 5-11 are encouraged to put on their best rodeo clown outfit and participate in the Parade of Clowns. The parade will end with a group photo in the arena. This year, the Behind the Chute Tours return with an additional tour added to accommodate demand. Tours are at 4:30 p.m. and 5:30 p.m. daily. Participants can “venture to where all the action happens.” Meet the stock contractor, contestants and arena crew, get close up and personal with arena equipment, see the livestock and meet the clowns. 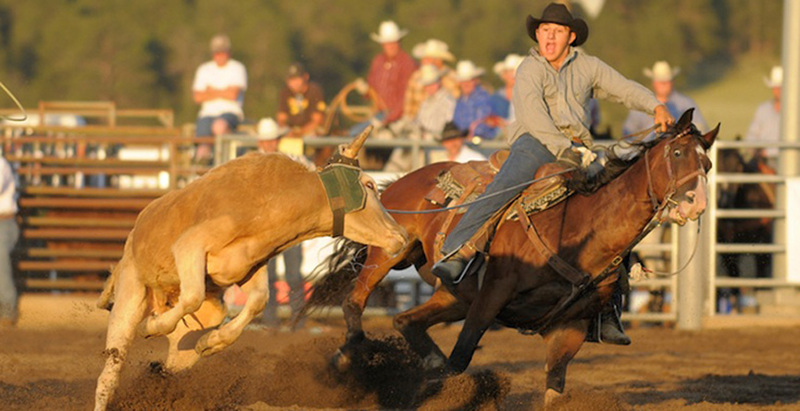 Ask questions and learn more about the sport of rodeo from the insiders. “Purple Night” takes place July 10 in conjunction with the Man Up Crusade to bring awareness to the epidemic of Domestic Violence and Teen Dating Violence. Participants are encouraged to done anything purple to show support. On Saturday night July 11, The Roof Top Rodeo and Estes Park Western Heritage Inc. have partnered with Wrangler and the Tough Enough To Wear Pink organization and encourage cowgirls, cowboys, spectators and volunteers to show their support by wearing pink to the Rodeo. All proceeds from the sales of Tough Enough To Wear Pink merchandise will go to a local charity. Professional Bull Riding Pro Touring Division also visits Estes Park, July 3-4, bringing the toughest bull riders in the world and the best bulls anywhere. Visit www.rooftoprodeo.com for schedules and additional information. 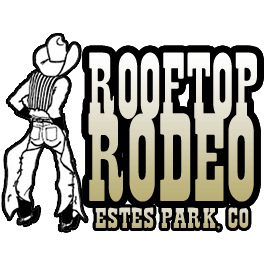 Tags: Estes Park, Rooftop Rodeo. Bookmark the permalink.